Diabetics could one day be able to monitor their blood sugar levels using bionic contact lenses, instead of having to resort to painful finger pricks. Researchers have developed a fuel cell that runs on tears, which they say could power lens-mounted glucose sensors. The idea of using lenses for diabetic monitoring has been around for years, as glucose levels in tears track blood glucose levels. 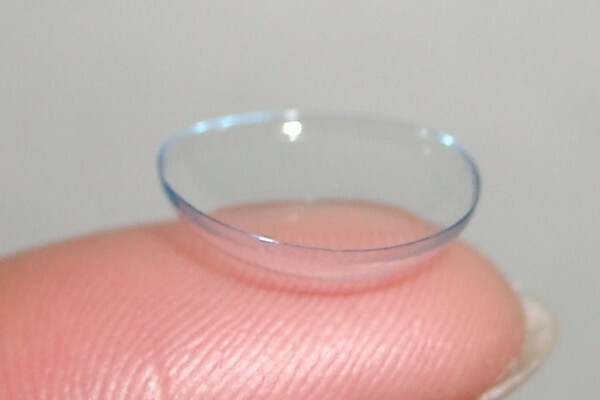 An electrical glucose sensor in a lens would be in constant contact with tear fluid, and could produce readings for an on-the-spot display that could be easily read by the wearer. But such a sensor would need a power source, and so far this has proven a major stumbling block. An international team led by Sergey Shleev at Malmo University, Sweden, may have come up with a solution by developing a biofuel cell that runs on the ascorbate (vitamin C) and oxygen naturally present in tears. The cell uses two organic catalysts at the anode to oxidise ascorbate, and the enzyme bilirubin oxidase to reduce oxygen at the cathode. Together, the electrodes power the cell. Using human tear samples, the team showed the fuel cell could generate power from tears without altering their glucose content.The cell's power output is very low - theoretical calculations estimated it could produce up to 22.1µW in an actual contact lens, based on the ascorbate concentrations and rate of tear flow in a human eye. But the team say this could be enough to power a tiny sensor, particularly if the electrode sizes could be increased by using both sides of the lens. 'An ascorbate/oxygen biofuel cell could be a suitable power source for glucose-sensing contact lenses,' the team summarise in their paper, adding that all the components used appear to be biocompatible.